But the new model has a 2MP front-facing camera (up from 0.3MP on the previous version) and works with microSD cards up to 400GB (up from 256GB). You can also install apps to the microSD card if the built-in storage capacity isn’t enough for you. Unfortunately, battery life gets a bump down from 'up to 12 hours' to 'up to 10 hours' mixed usage. The update is focused on Alexa. With the latest Fire HD 8, it is possible to interact with Alexa anytime. It is not clear if this feature is hardware related - if it isn't, based on Amazon's firmware update track record, then the previous two generations should receive the software feature. The tablet can also be purchased with a show mode charging dock. The dock charges the tablet and turns it into smart-display when docked. The dock isn't new, as it was released in July 2018 in the US but is only now made available in the UK. In the US there is also a version of the dock for the Fire HD 10. Interestingly, Amazon UK doesn't sell the dock separate to the latest Fire HD 8 (Amazon US does sell the dock separately). I think Amazon UK want a reason for customers to buy the latest tablet, as the previous generation is compatible with dock. The latest iteration is about Alexa but the previous two generations should get the new Alexa software features. I also think the show mode charging dock will eventually be sold separately or made available through third-party sellers. This means if you don't care about the front-facing camera then there is no reason to get the latest model. Battery life is poor for an e-reader. The Kindle Oasis 2 has a 1000 mAh battery capacity and I found the device drains completely after two days of continuous use. To compare, the Kobo Aura One has a 1200mAh capacity and after Kobo’s recent firmware updates lasts longer than the Oasis 2. The Kindle Oasis re-charges fast so that somewhat makes up for the poor battery life. The text is sharp, but the contrast isn’t good. Text appears dark grey rather than inky black. 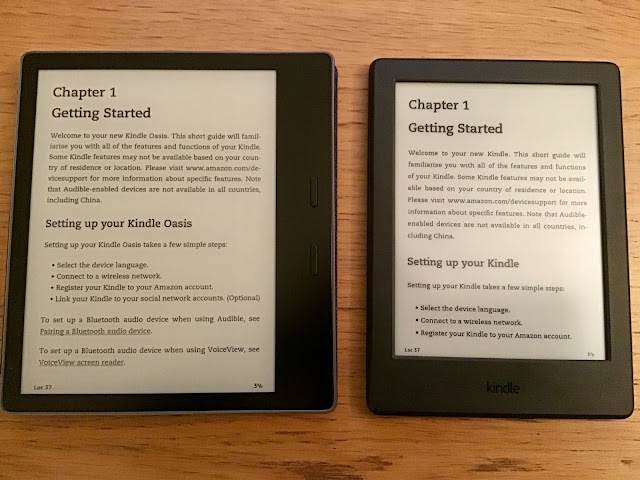 I even found the Kindle Basis has darker text (see comparison picture below). Due to the sub-standard contrast, I tend to bold text to make it appear darker. To be fair, E-Ink has never reached the deep black you get on a Super Amoled screen. CLEARInk promises to deliver superior blacks but we haven’t yet seen a consumer e-reader with the technology. I don’t like the form factor. Amazon claims the uneven design makes it easier to hold. The original Amazon case was designed to make it easy to remove the Oasis 2 and read one-handed. This was a device designed to be used without a case. There is a problem: when reading the device without a case the metallic back is cold to the hand. The thin edges also make the e-reader feel fragile. It would’ve been a better idea if Amazon released an anti-knock bumper case for the Oasis 2 instead of the now-withdrawn official case that doesn’t completely cover the device. The Kobo Aura One’s all-plastic design might be utilitarian, but it works. Plus, the Aura One’s design makes finding a good case easier. I use a Belkin iPad Mini case that fits the device perfectly. In my view, the contrast issue is the biggest problem. An e-reader does one thing and should do it well – the faded text is a drawback in that regard. The Oasis is a good e-reader, but it does not offer anything exceptional beyond the extra screen size to justify its price. Considering screen size, the Kobo Aura One is larger and cheaper. The different Chromebook models and versions can be confusing. I think Acer is the greatest villain in this regard. If you want better clarity to compare between different models, then visit Zipso's excellent Chromebook specs & performance comparison chart. The chart goes back to the first Chromebook released in 2011. I am testing the recently released ASUS E203MA and my initial impressions are mixed. The glossy screen is similar to the HP Stream 14 – the difference is that the ASUS E203MA has slightly better contrast. However, 1366 X 768 on a smaller 11.6 screen is acceptable. Overall, the screen is disappointing. The real positive, other than the 4GB RAM, is the updated N4000 Gemini Lake Celeron processor. I used both the Celeron Braswell N3060 and Apollo Lake N3350 and noticed little difference. This time the N4000 update gives a performance boost. The performance boost coupled with the extra RAM for multi-tasking means you don’t get the slow-down experienced with other entry-level laptops. Hopefully, I’ll post a more detailed review soon.